The location of the Tombs of King David and his family can be easily understood once the proper site of the Temples of God is taken into account. If the biblical and historical evidence is correctly understood (and I believe it is), then what those Tombs could contain would change the world and lead millions to accept Jesus Christ as their Messiah, starting from Jerusalem. He was exactly correct in this assessment. Later, in chapter 24 of his book, Dr. Martin shows that in the time of Simon the Hasmonean the buildings on the top of Mount Zion, including the Zerubbabel Temple, were demolished and their function transferred to different locations. The hill was cut down to bedrock and an enlarged Temple was reconstructed on the original site, expanding to the north and to the west. Dr. Martin goes on to state that Simon’s transfer of structures included the sepulchers of David. He thought that the sepulchers of David comprised an above ground structure. 3 While this may be true for some sort of structure at the entrance to the sepulchers, it was not the case that the underground structures of the sepulchers of David were transferred. While sepulchers of other kings of Judah were indeed moved, the sepulchers of David, Solomon, and others were not transferred. They remained in their original location but inaccessible to the world. Substantial biblical and historical evidence can now show a more precise location of the unopened Tombs of King David and his immediate family in relationship to one unchanged foundational wall of the Temple sanctuary, above and west of the Gihon Springs. This same wall did not change position throughout the various Temple reconstructions after the destruction of the original Solomonic Temple. This wall was used in the reconstruction of the Temple by Zerubbabel after the return of the people from Babylon. The same wall was used again in the later enlargement during the time of Simon the Hasmonean. The wall was used for a final enlargement of the Temple by King Herod. Each time the Temple was rebuilt or enlarged, the position of the southern wall remained unchanged. Enlargements of the Temple did not expand to the south, but only to the west and north. Toward the end of this article I describe the writings and artifacts that could be contained within the Tombs. You will be amazed! Keep in mind, that at present it is pure speculation what items might be within the Tombs, although the speculation is informed by intriguing historical references, as you shall see. Then I shall describe one possible method by which the sepulchers can be located even more precisely so that an archaeological excavation can be conducted and the sepulchers entered without damaging the precious writings and artifacts within, so they can be properly preserved. Genesis 47:29–30; Judges 8:32; 2 Samuel 19:38 are three examples of this ancient desire of Israelites to be buried with their ancestors. Failure to do so was seen as a curse and disaster. 6 King David was not buried with his fathers, although David helped others fulfill their burial customs (2 Samuel 2:32, 3:31–32, 17:23), even reburying the bones of King Saul and his son Jonathan in a more proper grave (2 Samuel 21:11–14). David did in fact make provision for his burial. To be more precise, God made that provision for David’s burial and David acceded to God’s desire. Although God did not allow David to build the Temple, he was allowed to gather everything necessary for its construction. The “pattern” for the Temple, the plan for its construction, was given directly from God Himself in God’s own handwriting! 12 When David died everything was prepared for Solomon to build the Temple of God exactly as God indicated. While David received plans for the Temple directly from God, no plans were necessary for the “house” that God “made” for David (2 Samuel 7:11). As you read through David’s response to God, try to understand the mental turmoil David was going through: First, David desired to build God a Temple. His request was refused by God, but then God tells David that He “made” a house, a structure specially intended as David’s burial place. At the same time God tells David that a son of his shall build a Temple. Sometime later David receives the plans for the Temple from God’s own handwriting. God was pronouncing a death sentence upon David. David naturally asks, “Oh God, why?” During his prayer to God, David answers his own questions, and then concludes with the confession that whatever God has in store for him, David will accept from God in obedience. Read David’s entire response to God in 2 Samuel 7:18–29, keeping in mind that when David refers to his house he is referring to the tomb or sepulcher that God made for him (not the proposed Temple, the house for God). In fact, David did not fully understand what God had in mind. After all, David just received news from God that he was going to die! David’s prayer to God is a model for us whenever we are presented with a major situation in life that we do not like or understand, when circumstances before us seem totally opposed to what we thought was God’s will. David challenges God with questions about what God really wants. The mention of the “house,” meaning the Tomb that God has prepared for him, has David questioning God’s intention. “Then went king David in, and sat before the Lord, and he said, ‘Who am I, O Lord God? and what is my house, that you have brought me hitherto [brought me so far]? And this was yet a small thing in your sight, O Lord God; but you have spoken also of your servant’s house for a great while to come. And is this the manner of man, O Lord God? What God says in an off-hand manner, as David refers to it: “a small thing in your sight,” is to David a death sentence! David complains that he has been brought so far in life, apparently to be given a sentence of death by God Himself at the pinnacle of God’s accomplishment using David as his servant for the good of God’s people. David does not understand. Like the apostle Paul (Ephesians 1:11), David realizes that God does everything according to His own heart and as He has spoken (“for your word’s sake,” verse 7:21). do as you have said. let the house of your servant David be established before you [close to God]. Note the numbered points in the passage. David completely and totally accepts what God presents to him. It was not easy for him. He had to search his heart to accept the difficult thing God proposed. David finally “found in his heart to pray this prayer.” He will no longer struggle with God about this matter. David was truly a man after God’s own heart, willing to fulfill God’s will (Acts 13:22, with Paul citing 1 Kings 15:5). David understands that God intends good for him regarding the Tomb. David accepts God’s pronouncement and asks that God will bless the house. Contrary to his expectation at the time, David lived decades more. In fact the exchange of 2 Samuel chapter 7 occurred soon after the Ark was brought to Jerusalem, before David even saw Bathsheba and they married. Solomon was born from that union and he would build the Temple as God intended. And now, O Lord God, the word that you have spoken concerning your servant, and concerning his TOMB, establish it for ever [olam, for the age], and do as you have said. And let your name be magnified for ever [olam, for the age], saying, The Lord of hosts is the God over Israel: and let the TOMB of your servant David be established before you. For you, O Lord of hosts, God of Israel, have revealed to your servant, saying, I will build you a TOMB: therefore has your servant found in his heart to pray this prayer unto you. Now substitute the word “dynasty” where “house” is in the original, where I have “tomb,” and note that the passages do not make near as much sense. David always desired and intended to have a dynasty. It is the goal of every ancient ruler. Why would David complain when God makes it so? Would David question God for creating a dynasty from him, as he questions God in verses 7:18–19? Would David ask for God’s blessing for something already so positive? I analyzed 2 Samuel chapter 7 in detail to show that the Tombs of David are not ordinary sepulchers. They were made by God Himself for a special purpose, and that purpose will last “for the age.” That age has not yet seen its completion, even to our day. “Truly is not my house so with God? For He has made an everlasting covenant [a covenant for the age, olam] with me, Ordered in all things, and secured; For all my salvation and all my desire, Will He not indeed make it grow? 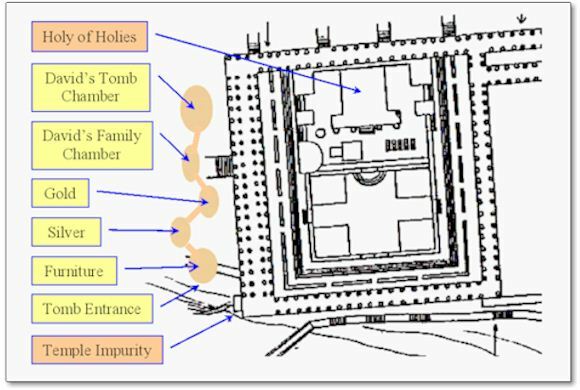 The Tomb that God built for David is indicated in several contexts of Scripture by the phrase “House of David.” While that phrase certainly is often used to denote David’s kingly descendants, it is important to distinguish by the usage, in context, when “House of David” refers to the Tombs of David. In my article “The House of David” the term “house” often means “tomb” if the context indicates. 17 Two other definitive passages that indicate that “house” can mean tomb or sepulcher are Ecclesiastes 12:5, 7 and Nehemiah 2:3. “And it shall come to pass in that day, that I will call my servant Eliakim the son of Hilkiah 19: And I will clothe him with your [Shebna’s] robe, and strengthen him with your girdle, and I will commit your government into his hand: and he shall be a father to the inhabitants of Jerusalem, and to the house of Judah. In this context “House of David” is a physical structure and does not refer to the descendants of David, even though the earlier phrase “house of Judah” refers to the people of the kingdom. This is clearly the case because of the reference to the key, and to opening and shutting. Keys do not open and close people. A key is used to open and close doors and enclosures, locking and unlocking them. In this case the door is to the “House of David,” a real physical structure and place. There is likely a direct connection to the Temple or the palace of the king. And yes, keys in ancient times were so large that they were put on the shoulder. The name “Eliakim” means “God raises” or “God sets up.” This and other factors show that Isaiah 22:22 has a direct messianic reference as used in Revelation 3:7, almost a direct quote with one important change, in the message to the ekklesia of Philadelphia where it refers specifically to Christ. The difference between the two passages is that Isaiah 22:22 has the long phrase “key of the house of David,” and Revelation 3:7 reduces it to “key of David.” The phrase “house of” in Isaiah is missing in Revelation, yet the reference to Isaiah in Revelation is obvious. 20 The “key of the house of David” refers to the sepulchers of David. We shall know in the future whether the sepulchers of David are part of the door opened by Christ. This verse indicates that there were several “sepulchres [plural] of the sons of David” in the City of David. They comprised the sepulchers of the kings of Judah up to the time Hezekiah was buried. Was Hezekiah buried with David? Perhaps. This may be what is meant by “chiefest of the sepuchres of the sons of David.” 22 Of the first 12 immediate heirs of David all are said to be buried in the City of David. The successors to Hezekiah were not buried there. We come now to a verse that discusses the “wall” that gives us a major clue to a more precise location of the Tombs of David. It is to be found in Ezekiel chapter 43. Important information is then given regarding the sepulchers of the Kings of Judah in direct relation to God’s presence. God took action and consumed the evildoers. Now God wants the carcasses and their sepulchers removed: “let them put away … far from me” (verse 9). This was done in the time of Simon the Hasmonean. How close were the sepulchers of the kings to God’s sanctuary? Verse 8 indicates that “thresholds” and “posts” separated the sanctuary from “the carcasses of their kings.” It appears that these sepulchers were above ground, unlike the sepulchers of David that God made. The text does not say they were in graves underground. Reference to “thresholds” and “posts” indicate buildings. For the Sanctuary the “thresholds” were doorways in the outer wall, while the “posts” were likely upright beams that supported the lintels of the doorway. 25 Those were often highly carved and likely had idolatrous designs. Most importantly for our consideration here is that there was only “the wall between me and them.” The sepulchers containing “the carcasses of their kings” may have been along side the wall of the sanctuary so that the separation of just one wall was the distance of the sepulchers of the kings to God’s sanctuary. If we can identify that wall, it will give us a major clue as to the location of the sepulchers of the kings, and most particularly the House of David. The evil kings and others in Jerusalem were consumed by God’s anger. This was done by the invasion of the Babylonian army in successive attacks, mass death in Jerusalem, and exile for thousands in the city. God had no grievance with the good and righteous kings of Judah. Once the carcasses of the evil kings were removed from His presence, away from His sanctuary, God says He shall “dwell in the midst of them” for the age, meaning to the end of the age. David, Solomon and their families were buried underground in the chambers “made” for David by God close to the Temple sanctuary. The evil kings of Judah were buried in above ground structures. It was the “carcasses” of the evil kings and their sepulchers that were removed in response to God’s command (Ezekiel 43:9) not the sepulchers of David that were deep in bedrock. When Simon the Hasmonean cut down Zion and the Temple in fulfillment of Isaiah chapters 25 to 35, he also moved “the carcasses of their kings.” Perhaps the earthquake that occurred (Isaiah 29:2–6) that destroyed a portion of the Temple and the city of Jerusalem, as Dr. Martin believed, caused Simon to decide, with support of the religious leaders and the people, to cut the remains of Zion down to bedrock. 26 The earthquake might have prevented Simon from entering and moving David’s sepulcher, although Simon’s son, John Hyrcanus, was able to enter the Tomb and remove treasure (as we shall see below). There was only one king of Judah at any one time. In prior days they did their defilements in the valley of Tophet, now they do it openly in Jerusalem on the rooftops of houses and on the rooftops of “the houses of the kings of Judah.” This is referring to the houses or sepulchers of the kings where the people of Jerusalem committed their evils — in the cemetery of the kings. Those acts include human sacrifice (Jeremiah 19:4–5, God’s punishment, verse 9). These above ground sepulchers were moved during the time of Simon the Hasmonean when he demolished and moved all the buildings above bedrock. The wall that was not moved but merely lengthened was the southern wall. The eastern wall did not move either; it was already “into” the Kedron Valley and could go no further. The placement of that wall was not changed because the Tombs of David were located on the other side of that wall, deep in bedrock. are going down from the city of David. “Graves of David” = “house of David.” This fits with Zechariah chapter 12 above which contrasts David with “him who they have pierced” which was Jesus (Zechariah 12:10, John 19:37). House of David in Zechariah? The last 6 chapters of Zechariah were prophecies given by Jeremiah, even though it is found in the Book of Zechariah. 30 Zechariah chapters 12–14 is a single continuous prophecy. Chapter 12 tells Israel’s future victory over its enemies and then mourning over the one pierced. Chapter 13 tells about how idolatry shall end in Israel and how the shepherd is struck and the flock scattered. Chapter 14 tells about future war and ultimate victory. In these three chapters of Zechariah there is a recurring phrase, “in that day” that occurs 19 times like a drumbeat throughout the prophecy. Another important phrase, “house of David” occurs five times between Zechariah 12:7 and 13:1. The reference is not to the royal descendants of David. 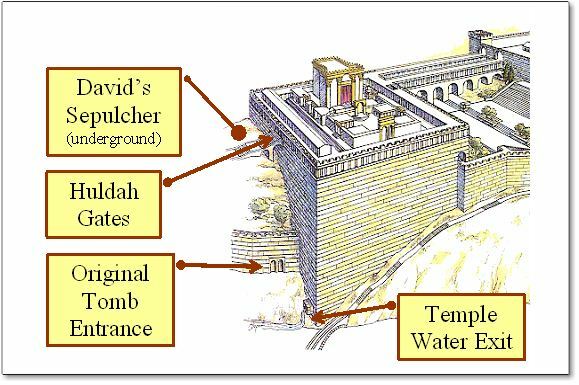 Every instance of those five occurrences of “house of David” refers to a physical structure, and indicates the sepulchers of David. This is not a hyperbolic poetic comparison about the power of the “inhabitants of Jerusalem” vis-à-vis the descendants of King David. God will defend the inhabitants (verse 8) and destroy the attackers (verse 9). Something about the “house of David” will be involved to make the “inhabitants of Jerusalem” be protected and have God intervene to destroy the attackers. “As for Herod, he had spent vast sums on the cities, both outside and inside his own kingdom; and because he had before heard that Hyrcanus, who had been king before him, had opened David’s sepulchre, and taken out of it three thousand talents of silver, and that there was a much greater number left behind, and, indeed, enough to suffice all his wants [i.e. great wealth remained in the sepulcher], he had a great while an intention to make the attempt; and at this time he opened that sepulchre by night, and went into it, and endeavored that it should not be at all known in the city, but took only his most faithful friends with him. As for any money, he found none, as Hyrcanus had done, but that furniture of gold, and those precious goods that were laid up there; all which he took away. Herod’s episode gives us more useful information. Herod’s suspicions were correct and he knew the precise location of David’s sepulcher, but entering it was the problem. He expected more treasure to be in the tomb than what Hyrcanus had already taken away, and he was correct. He took furniture of gold (gold leaf on wood), and other valuable objects, but no money. Josephus specifically says that Hyrcanus and Herod were both unsuccessful getting to the bodies of David and Solomon, but implies that the bodies were there. Indeed we shall see below that David’s body was indeed in the Tomb. Josephus has more information. The Greek word “money” in these two passages frequently means simply possessions or wealth. In Antiquities 16:180 it says Herod found no money, and in Antiquities 7:394 it says he did. This cannot be reconciled. In any case Josephus relates that Herod became frightened because of fire killing his fellow grave robbers and he never entered the Tombs again so far as we know. 31 Although the bodies (plural) of David and Solomon and others were unattainable to both Hyrcanus and Herod, they expected to find the bodies. Remember Isaiah 22:22 about the opening and shutting, shutting and opening. The “propitiatory monument” that Herod constructed would not have been placed at a newly moved tomb, but it makes sense that the monument would be at “the mouth of the sepulchre” of a cave-like structure. I propose that the sepulchers of David and Solomon were not moved by Simon the Hasmonean for two reasons: (1) they contained the bodies of righteous kings whose Tombs did not defile the sanctuary (Ezekiel 43:7–9), and more importantly (2) their sepulchers were far underground in bedrock. Simon reduced the hill where the Temple was located down to bedrock; he did not carve into the bedrock. The sources Dr. Martin cites in his book The Temples That Jerusalem Forgot, p. 343, make this abundantly clear. King David and Jesus were associated by the apostle Peter on the day of Pentecost after Jesus ascension. Speaking from Jerusalem Peter writes. Reading the text of Acts 2:29 critically, Peter knew where David’s tomb was, it seems to be visible to Peter and his audience, almost as if Peter was gesturing to it while he was speaking. Peter understood David’s body to be in the Tomb. If David is dead, buried, and his tomb is still with us, then the body should be there also. That phrase “his tomb is still with us unto this day” is meaningful if one remembers that many of the tombs of the kings of Judah were moved by Simon the Hasmonean. Peter is saying that David’s tomb was not put elsewhere, but that the body of David is in the original tomb. David’s sepulchre would be south of the Temple, at God’s right hand, just as Psalm 110 states (Acts 2:35). Note how Peter and Paul both begin talking about David and then transition to talking about Jesus? This is intentional in both instances. The same thing was done in Zechariah chapter 12. That prophecy relates to the House of David and then changes to talk about him “whom they have pierced” (Zechariah 12:10). The apostle John states that prophecy was fulfilled by Jesus at His crucifixion (John 19:37). Rabbi Akiba (b.40 C.E. and d.135) wrote this intriguing item after the destruction of the Temple about the burials and tombs within the city of David. He refers to the clearing away of the sepulchers, likely meaning the sepulchers of the kings of Judah discussed above. First notice what Rabbi Akiba was told. He was told about “the sepulchers of the house of David.” It is easy to see how “house of David” could come to mean the “sepulchers of David.” Second, note that there was a tunnel of uncleanness close to the sepulchres of the house of David and the sepulcher of Huldah. The term “uncleanness” is a direct reference to Zechariah 13:1–2 above. Third is a most significant point. Nobody ever touched those two sepulchers. That means that according to this author, who wrote after the destruction of the Temple, the expectation was that the bodies of David’s family and Huldah the prophetess should still be inside intact sepulchers. This means that the Romans did not enter the sepulchers, even though Josephus, a friend to Rome, apparently knew where the sepulchers were. That means that the Romans, with all the time and resources in the world after the destruction of Jerusalem in 70 C.E., were not able to access those sepulchers. Remember from Ezekiel 43:8–9 that the carcasses of the kings had just a wall of separation between them and the sanctuary of the Temple. I showed that was the south wall of the sanctuary. Most all of the sepulchers were moved by Simon the Hasmonean as per Rabbi Akiba. Two groups of sepulchers were not moved. Those were the sepulchers of the house of David and the sepulchers of Huldah the prophetess. There was only one set of gates in the southern wall of the Temple enclosure. They were named the “gates of Huldah” because they pointed to a location in the direction leading from the Temple through that gate. I propose that the significant location was the sepulcher of Huldah, just where it should be located. Ezekiel 43:7–9 gave the final key to the location of the sepulchers of David, the “house of David.” Everything fit into place with that piece of the puzzle. After all, who would have the closest, best location for their sepulcher? David would have. After all, God “made” David’s sepulcher for him and probably all of the chambers for David’s family, which David then had craftsmen “finish.” David’s tomb would have been the best location, chosen by God, decades before the Temple was constructed and even before Solomon was born. It is not by chance that, with God facing east from the Temple, if David’s sepulcher was to the south, then David would be at God’s right hand, awaiting the resurrection from the dead (Psalm 110:1, Matthew 22:42; Acts 2:34–35). They are hidden (Josephus), but locked (Isaiah 22:22); known but inaccessible (Acts 2:29, 34–35, Josephus). They are up high on the hill (Isaiah 22:22, Ezekiel 43:7–9), but in the bedrock. There are several chambers in the sepulchers (2 Chronicles and Josephus). They are on the other side of the southern wall of the Temple sanctuary (Ezekiel 43:7–9). There was apparently one entrance down near the water outlet from the Temple into the Kedron Valley (Babylonian Talmud). Attempts were made to enter the sepulchers by Hyrcanus (Josephus) and Herod (Josephus). The body and tomb of David were intact at Pentecost in 30 C.E. (apostle Peter) and soon after the destruction of Jerusalem in 70 C.E. (R. Akiba). If David’s sepulchers are immediately south of the southern Temple wall, figuratively David would be at God’s right hand (Acts 2:34–35). Speculations: What Could Be in the Tombs? Josephus mentions silver, other money or valuables, gilded furniture, and “precious goods” (Antiquities 16:181) in the sepulcher of David, along with the bodies. There is good reason to believe there might be other valuable items inside as well. Let us examine these and other possibilities of what might be in the Tombs. The possibilities are fascinating but keep in mind that they are speculative. David was buried with more wealth than any other king in history, up to that time. Hyrcanus took out 3,000 talents of silver (again, at 48 pounds per talent). Herod the Great also took “treasure” from the Tomb of David, although he did not reach the chamber with the bodies (Josephus, Antiquities of the Jews 7:394). There was much more still in the Tomb. Analysis done by Gary Arvidson shows there should be a considerable amount of gold and silver remaining in the Tomb of David, perhaps billions of dollars worth. 33 Everyone should understand, however, that the gold and silver is YHWH’s, given through David, and it would be the property of the government of Israel. However, there would be no possibility or concern about the tomb being raided by poachers. Hyrcanus and Herod both failed to reach the bodies, and they had the resources of their empires at their disposal. It is not said that the Tabernacle of Moses would be reconstructed, but that the tabernacle of David would be raised again. The Tabernacle of David was constructed before the Temple was built, and lasted until the Temple was completed and dedicated by Solomon. Note also that the result of this rebuilding of the Tabernacle, rebuilding of the ruins, and the setting up all occurs, the Gentiles will seek after YHWH. Solomon put his throne in his palace and built a raised porch to put the throne upon (1 Kings 7:1–7). The question must be asked: if Solomon had a new physical throne built for himself, with great glory and splendor, what then was done with David’s physical throne? Would it have been destroyed? Would it have been thrown in the trash? Would it have been used like any other chair? No. David’s physical throne likely would have been put in David’s “house,” his Tomb. A psalm of David included into the Book of Psalms by Hezekiah, Psalm 122, specifically states that there are multiple “thrones” of the house of David. That throne is in the House of David. It is within the sepulcher of David. The Bodies of David, Bathsheba, Solomon, et al.? It might be possible to obtain DNA samples from David’s body. If the bodies of David, Bathsheba, and Solomon are present (or other family of David), then it is possible that the entire DNA structure of the Davidic kingly line could be determined. That would mean that any Jewish male could test his DNA to see if he were directly descended from King David. If so, that person (or persons) may in fact be heir to the throne of Judah. The discovery of written documents, whether on tablets or more perishable material, is the greatest aspiration of every archaeologist. Any find of written documents from the time of King David contained within the Tombs would be a discovery of the highest order. Very few written documents of any size from ancient Palestine exist anywhere, outside of those preserved in the Holy Scriptures. A major find of documents would increase considerably our vocabulary of ancient Hebrew. There are a surprising number of Hebrew words in Scripture that occur only once. When that is the case, translators of the Old Testament simply have insufficient context to determine the true meaning of those once-used words. This is because the meaning of a word is determined by the words around it. The more words occur, the more context there is to determine the precise meaning of a word. Those translations of once-used words are speculative at best, and may be completely wrong, even when hints and suggestions that can be gleaned from later Jewish writings and the Greek Old Testament (the LXX). These hints were themselves written sometimes a thousand years after the original was written. Job and the Song of Songs have the largest number of words used only once in Scripture. This means that portions of the texts of those books may be misinterpreted. Writings found within the Tomb of David would increase and perhaps multiply our understanding of ancient Hebrew, and ultimately the meaning of important Scriptures, particularly prophetic Scriptures. God communicates to His people through His word and it is important — especially in the decades before Christ returns — that we understand His words and His message. Let us inquire about the possible writings that may be in the Tombs of King David. The Psalms of David were important to the life of Israel and to the Temple. David himself composed much of the prose of the Psalms. Many of the Psalms were set to music that he may have written, and he established the procedures for the music for the Temple rituals, particularly for the feast days when Israel would gather. These were followed by Solomon. Would the original compositions of those Psalms and procedures be discarded? Perhaps they were kept in the Temple, but just maybe they were buried with the composer and writer. We know that music was very important to David. There may be instruments and documents that give clues help us understand the music of the ancient Israelite kingdom, information that could be useful in the Temple to be constructed before Christ’s return. If Solomon is buried with David as Josephus indicates, and if there are written documents in with the Tombs of David, then there likely will be writings of Solomon also. Of Solomon’s 3,000 proverbs, not all are contained in Proverbs and Ecclesiastes. Of the 1,005 songs he is reported to have written, we have only one (Song of Songs 1:1). Solomon’s proverbs, songs, and writings of natural observation, that today we call science, might also be in the Tombs with Solomon. The “Pattern” of the Temple? David was given a pattern of the Temple by God Himself. That pattern was given in writing. Again, refer to my article “The Pattern of the Temple” at http://www.askelm.com/temple/t031102.htm. That writing was the pattern of the Temple as described in 1 Chronicles 28:11–19. What happened to that pattern after the Temple was constructed by Solomon? What would you do with an object given to Israel by God Himself, in His own handwriting? Such a document similar in importance to the tables of stone given to Moses. They also were written by the hand of God (Exodus 24:12, 31:18, 32:15–16; Deuteronomy 5:22; Hebrews 8:5), and placed within the Ark of the Covenant. Is it reasonable to think that the “pattern” of the Temple would have been buried with the man who received it, after its usefulness was done? The impact of this discovery of the pattern of the Temple (whatever that “pattern” might be), would be incredible, even for those who would not believe it was written by God Himself. It would give to scholars and all believers in God important details — in writing — about the Temple and the Israelite kingdom. The Hebrew term dabar in Hebrew means “word,” but it also can mean “book” and even “history,” and it is translated that way in many versions. Certainly a compiled set of records could be called by either of the latter terms. The books by the three authors contain information about David’s acts during his 40 years reign as king. They also tell about the great deeds, (“his might”) that he did whether personally or as the leader of Israel and Judah, probably during his entire life. For example, the song about Saul and David may be contained in those writings (1 Samuel 18:6–7). The books also relate about what happened when (“the time that went”) in history. This likely means that the accounts in the books give the events in sequence and how those events relate to other kingdoms, nations, and peoples. This means that chronologies of ancient history up to the death of King David could be understood with precision. This is important because little is known outside of Scripture about the world outside Israel and Judah during this period of the United Kingdom. This has implications for the kingdoms of Hatti (the Hittites), Assyria, and even Babylon which were not yet powerful. The mention in such documents of the Hebrew name of just one pharaoh (and there should be several mentioned) that could be identified from the Egyptian dynastic lists would revolutionize Egyptian and all of ancient history. At present there is a 400 to 600 year mismatch between biblical history and Egyptian history that has evaded any attempts to reconcile the two, according to accepted traditional scholarship. It is my belief that “suddenly” the misunderstood Egyptian chronology and history would coordinate positively to the biblical record. Ancient history would suddenly “make sense” to scholars around the world. Events in one kingdom could be understood as having an impact upon another kingdom. A drought in one place would have an impact upon another place. Finding these books within the Tomb of David would be a major breakthrough in understanding what the events in Palestine at that period of history. Even more important, as we approach the end times, it is vital that we have an accurate grasp of ancient history, to better understand the prophecies in the Bible in the time of David. Such knowledge would be informative for the great and sweeping prophecies that come after David. Such a discovery would show that the Bible is the basis for history of the ancient world, and that it is the standard to which all historical writings of the ancient world must compare. The Bible is accurate. I ask the question: If David did copy the Law given to him by “the priests, the Levites” (cf. Deuteronomy 31:9, 25–26), what happened to that copy after David died? Would it have been thrown in the trash? Or, just maybe, would that copy of the Law that David loved, written by David himself, be placed with his body in the “house” made by God — waiting — within the Tomb of David to be discovered? The Mishnah (the book of Jewish oral tradition and ritual, written down post-70 C.E.) states that no Scriptures can be thrown away or burned, they must be stored or hidden (Mishnah Shabbath 9.6, 16.1). Does this tradition date far back to David’s time, or did it even originate with David? We cannot know. However, burial of the king’s personal copy of the Law would be an excellent solution. If David’s personal copy of the Law would be in the Tomb of David, it would be the single most remarkable historical event this side of the resurrection and ascension of Christ. Can you imagine the impact on the world? The discovery of a genuine copy of Genesis, Exodus, Leviticus, Numbers and Deuteronomy all written in the old Hebrew text. 40 And the words would be written in King David’s own hand. I would think such a document would be “self authenticating,” although this too is speculation. David would be proud of his work and like anyone he would, in some manner, “sign” or identify his book to indicate that it was his copy of the Torah. Keep in mind that such a document would have been written some 200 years before Elijah the Prophet was born, and even longer before Isaiah, Jeremiah, Ezekiel and all of the Minor Prophets appeared on the scene. It might have been written before Solomon was born. The world would recognize and pay attention to the fact that the Law would be coming forth “out of Zion” (Isaiah 2:3, Micah 4:2). Most all Jews, Christians, and Muslims would rejoice at such a discovery! It could lead directly to the prophesied conversion of Israel beginning at Jerusalem (Zechariah chapters 12–14). A discovery of a “genuine” Book of the Law would have a tremendous emotional impact upon the entire world, but particularly for those in Jerusalem, and the entire discovery would be due to God’s sovereign act! Did you catch that? The Law will go forth “out of Zion,” while the Word of the Lord comes from Jerusalem. Isaiah and Micah were contemporaries and this was a prophecy for a time future to them. As Christians we understand that this prophecy was fulfilled through Christ, who was the Word of God and the fulfillment of God’s law. But look at verses that say similar things, keeping in mind that Isaiah 2:3 and Micah 4:2 and these other verses deal with Israel and not Gentiles: Deuteronomy 6:1; Isaiah 51:4; Jeremiah 31:6, 50:4–5; Zechariah 8:20–23, Psalm 25:8–9; Luke 24:27. Most people read the phrase “the house of David shall be as God,” and “as the angel of the Lord before them” and believe it refers to a situation similar to Joshua 23:10 where it is promised that if Israel is faithful to God, He shall assist them in their battles and “one of you shall chase a thousand.” However, Zechariah 12:8–9 specifically states that God “will seek to destroy all the nations,” not the House of David or the inhabitants of Jerusalem or the people of Israel. Many would consider the amazing discovery of the Tombs of David as a miraculous act of God, and they would be correct! Many would feel that God was sending them a message to change their lives, that He will soon be active in the world, and that God is revealing His Word to them after 3,000 years, starting with the Law of Moses. The contents of the House of David might contain such wondrous things (primarily writings confirming Scripture) that the world would suddenly seek God and a no-nonsense, truthful Gospel preached about Him. No one would doubt the authenticity of artifacts within the Tomb. Those most in awe would be the archaeologists, scientists, and scholars themselves! An original copy of the Law of Moses buried for 3,000 years waiting to be discovered intact with David’s body, which would be preserved but with corruption (Acts 13:36). A Torah in the ancient Hebrew letters could be easily compared to the current text of the Torah that the Jews use today. The world will be able to judge whether the Jews, as keepers of the oracles of God (Deuteronomy 4:8; Acts 7:38; Romans 3:2), have faithfully carried out that commission. What interesting discussions those would be! Imagine Scripture being discussed seriously over every major media! Thousands of textual and biblical scholars (Jew and Gentile) would leap to the task of analysis. Of course, discipline would be needed not to turn any of these “artifacts” into idols, whether that would be the bodies of David or Solomon, the “throne of David,” the pattern of the Temple, or other marvelous things that may be in the Tombs (Goliath’s sword and armor perhaps?). Also, the historical writings that may be in the Tombs must not supersede in our minds the canonical Scripture as we have today. Even though such a discovery would be seen as a miracle from God, such works would be for historical purposes and not to be considered Scripture. Most likely the Mystery would be diminished and discarded by most people in preference to following the Torah, forgetting that Christ has fulfilled all of those requirements. It makes sense, of course, because Jerusalem is where the preaching should begin. That is where the apostles were located. They were instructed to remain in Jerusalem to receive the Holy Spirit (Luke 24:49–53; Acts 1:4–5), and they did so. The preaching of the Gospel of the Kingdom of God began from Jerusalem after the grace of God’s Holy Spirit fell upon the apostles and many, many of the people. The final preaching of repentance and remission of sins shall also begin from Jerusalem. Remember that the law shall proceed from Jerusalem: “… for the law shall go forth of Zion, and the word of the Lord from Jerusalem.” (Micah 4:2), and “for out of [from]Zion shall go forth the law, and the word of the Lord from Jerusalem” (Isaiah 2:3), exactly from where the apostles began their ministry after that most important Pentecost of 30 C.E. The Gospel that will be preached shall proceed from Jerusalem shall be accomplished mostly by Jews who will accept Jesus as their Messiah, the Christ. The children of Israel shall return. The children of Israel shall seek the Lord their God. The children of Israel shall seek David their king. But through God’s grace, the children of Israel shall find Jesus their Messiah! Our job will be to ensure that they understand and have available to them the biblical knowledge of the reconciliation of all to the Father and Christ, and most importantly that they understand the Mystery of God as revealed to Paul and others in 63 C.E. This will be the toughest part because remember, most all believers in the 1st century rejected the Mystery, and even rejected the apostle Paul himself (2 Timothy 1:15). Although the location of the Tombs can be known biblically and historically, unfortunately the exact position of any of the chambers (and discovery of one will lead to all others) cannot yet be determined. This is due to several factors. First, the tomb chambers are within 75–100 feet of limestone bedrock above and west of the Gihon Springs, just south of the position where the southern Temple wall once stood. Second, the slope of the hillside containing the tomb chambers is about 60º, which makes tasks very difficult, but not impossible. Third, there are houses at the top of the hill and across the valley at the town of Silwan which would require a minimum of disturbance for such an endeavor. Fourth, while the proposed area is small geographically, we do not know how to precisely locate any one of the several Tomb chambers. The problem is one of technology, not evidence. At present the technology does not exist, so far as I have been able to determine. God must intervene, whether through technology (new or old) or through His direct act to reveal exactly where any one of the chambers is located. If we find one chamber we can find all of them, just as in Egyptian archaeology. Certain of the tombs of the Pharaohs are family tombs with several (if not dozens) of interconnected chambers. All the chambers of the David’s Tomb complex are connected, or were so connected in the past. Here is one process on how to proceed, once any one of the chambers is precisely located. It is acknowledged to be valid by professional archaeologists, geologists and other scientists. If a “fix” could be made on a chamber, the technique to “look inside” that chamber is easy and “off the shelf.” Of course the Israeli government, through the Israeli Antiquities Authority, would authorize and monitor all archaeological events. Funding would come from any one of several archaeological foundations. Everyone in the field will want to be part of such a project with a low risk, great reward ratio — once a sepulcher chamber is located. First, a one or two inch borehole would be drilled down to the sepulcher chamber. Then a plumber’s camera would be sent into the chamber. The camera would have its own source of light. Video from the camera would yield a 360º, color computer image of the interior of the chamber. After the image has been recorded, the camera would be extracted. Nitrogen (an inert gas) would be pumped into the chamber to force out oxygen that may have entered through the borehole. Oxidation is a great enemy to ancient artifacts and extremely destructive, particularly to written documents, until they are properly preserved. The borehole would then be sealed. From the video recording it is technologically easy (or so I am told) to produce a 3-dimensional image of the contents within the chamber. I have seen such a computer model of the Temple both in Jerusalem at the Davidson Center and in Los Angeles where the Temple computer model was developed on the UCLA supercomputer. A computer model of the “inside” of the chamber would be produced and analyzed. This model would reveal most of the important objects within the chamber, what they are and where they are. From analysis of the video data, specialists from around the world would be consulted. Archaeologists, geologists, and document preservation experts would determine the best method and direction of approach to excavate and enter the chamber, whether from the top, from the side, or from one of the connecting doorways. Remember, all of the chambers (now blocked after 3,000 years (Isaiah 22:22) were at one time connected either to other chambers or to passages to other chambers. By nature of this fact, discovery of one chamber would eventually lead to discovery of them all. I have communicated with experts around the world regarding how to locate a chamber 75 to 100 feet within limestone bedrock. I have looked into remote satellite scanning from space, remote scanning from the surface using radar, sound, magnetics, atomic resonance and other methods, all of which have been examined and debated. Techniques for deep mineral testing (used to discover coal, copper, and other such resources) could not yield results. Seismic testing as used in oil exploration is not suitable because it seeks information much deeper than we are seeking, and it is intrusive for the people living on the top of the hill and for the people across the Kedron Valley at Silwan. For quite a while I pursued contact with one company that seemed to have a non-intrusive deep scanning radar technology that could effectively “look” down to the required depth. When first approached, the president of the company indicated interest and agreed to a meeting. When I was close to their city I phoned to confirm the time, but he refused to meet. He said that although the David’s Tomb project was interesting, it did not interest him enough, so he did not want to meet, their company was moving on to other income streams. Quite disappointing, but it is probably for the best because other scanning experts had told me that the company’s claims would violate the laws of physics. Who knows? At this time I am very well informed regarding archaeologists, their activities, and events in Israel through sources in Jerusalem and elsewhere in that small country. Of course, I monitor events very closely regarding the goings-on in the City of David. At present there are no archaeological digs either at the site of the Temples (as indicated by Dr. Martin’s evidence) or over the general area of the tomb chambers. There should be no reason to dig in either location because they will not find anything — unless they want to carve through 75 feet of limestone. Remember, the Herodian Temple had every stone upon another removed (Matthew 24:1–2; Mark 13:1–2; Luke 21:5–6). The only artifacts that might remain would be from the later attempted reconstructions during the reigns of Roman emperors Constantine and Julian the Apostate. And no one is going to dig down through the limestone bedrock unless they already have a precise location (within feet) of where to put the borehole. Another alternative is to drill 50 or 75 or 100 boreholes in a search pattern on a 60º slope, but that is unreasonable. So, along the way there have been bumps in the road. The deep scanner letdown was a disappointment. I had hoped that events would move along with a pace based on technology but God would not have it be so. And then there have been people along the way who have claimed to have contacts (particularly in Israel) but those “contacts” did not even know them. All this is a part of life. To me personally it matters a great deal that Dr. Martin receive the credit he deserves regarding his Temple research. My purpose in publishing at this time (October 2006) is to put out this information to the world so others can add to or correct the information I put forth here, all of which demands an understanding of the correct Temple location based on evidence from Dr. Ernest L. Martin’s research. “The secret things belong unto the Lord our God: but those things which are revealed belong unto us and to our children for ever, that we may do all the words of this law. We who are children of God are much more than kings. We perform and “do all the words of this law,” through Christ, the Messiah, who performed all the words of the law (without exception) for us! Whether or not the discovery of David’s Tomb will be made (and I think it shall be so), what matters is that the truths of the biblical record be put out to the world — to the glory of God the Father. This time the world will pay attention and listen. 1 Portland, OR: ASK Publications, 2000. 3 Martin, Temples Jerusalem Forgot, p. 343–344. 4 See Dr. Martin’s article “The Coming Revolution in Knowledge” at http://www.askelm.com/prophecy/p060301.htm, and two articles by me “The Restitution of All Things, What to Expect” at http://www.askelm.com/news/n030621.htm and “Changes and the Knowledge Revolution” at http://www.askelm.com/news/n060301.htm. 5 In Journal of Near Eastern Studies 7:30 (Jan–Oct): 30–45. See also Nadav Na’aman’s article, “Death Formulae and the Burial Place of the Kings of the House of David” in Biblica, Vol. 85 (2004), pp. 245–254. This entire article is available online at http://www.bsw.org/project/biblica/bibl85/Ani08.html. 6 Yeivin cites Jeremiah 8:1ff and 22:18ff. It was also important in ancient times the burial sites be maintained. This is made clear when Nehemiah approached the King of Persia with a special request “the place of my fathers’ sepulchres, lies waste, … send me unto Judah, unto the city of my fathers’ sepulchres, that I may build it” (Nehemiah 2:3, 5). 7 See my article “A Name for the Temple of God” at http://www.askelm.com/news/n020921.htm. The Temple was where God placed His name. In Psalm 132 the Psalmist (apparently not David), records David’s thinking about his desire to build a Temple. 8 Outside of 2 Samuel chapter 7 the phrase “House of David” does often refer to David’s descendants. See my article “House of David” at http://www.askelm.com/temple/t040801.htm. Context determines how and where “House of David” is used, whether to mean a structure or descendants. 9 See my article “House of David,” and Lyle Eslinger, House of David or House of God: Rhetoric of 2 Samuel 7, Journal for the Study of the Old Testament, Supplement Series 164 (Sheffield, England: Sheffield Academic Press, 1994). In communication with Professor Eslinger, he says that I have understood and used his analysis correctly, although in a surprising manner beyond what he foresaw when he wrote his technical analysis book on the single chapter of 2 Samuel 7. Professor Eslinger did not foresee that the “house” that God built for David might be a structure to last for the age of undetermined length. Even though David was a man after God’s own heart (1 Kings 11:38, 15:5; Acts 13:22), Eslinger puts forth the idea that David’s desire to build a Temple to YHWH was in part self serving and was intended to consolidate his rule, centralizing all aspects of power in Israel under David’s personal control. Eslinger concludes this was God’s reason for rejecting David as builder of the Temple. 10 The Jewish historian Josephus tells us that there were “sepulchral caverns of the kings” (Jewish Wars 5.147). It is unclear which kings Josephus is referring to; they were likely some of the later Hasmonean kings. 1. The house that God would build for David, verse 7:11. This structure would be the Tombs of David. 2. The seed of David’s descendents, verse 7:12. These would be the Kings of Judah (cf. Psalm 132:11–12). 3. “… the throne of his kingdom,” verse 7:13. This throne is occupied by the resurrected Christ today (Luke 1:32, citing Isaiah 9:7). It also refers to David’s descendents who also occupied the “throne of David” between the time of David and Christ, as in Psalm 132:11–12; Jeremiah 17:25, 22:2–4, 30, 29:16, 33:17, 21, 36:30. 12 See 1 Chronicles 28:11–19 and my article “The Pattern of the Temple” at http://www.askelm.com/temple/t031102.htm regarding additional biblical evidence. 13 2 Samuel 7:18–29. David goes before God at the tabernacle that held the Ark of the Covenant. This was not the tabernacle of Moses, which was still at Gibeon (2 Chronicles 1:13). This was the tabernacle of David (2 Samuel 6:17; Isaiah 16:5; Amos 9:11–12; and Acts 15:16–17). 14 In 2 Samuel 7:11 God will “make” (asah, to do or make) a house for David. In 1 Chronicles 17:10 God will “build” (banah, to build) a house for David. God fulfilled His purpose. Compare 2 Samuel chapter 7 is 1 Chronicles 17:10–27 side by side. 15 An example of “finishing” a tomb would be King Tut’s tomb, which was richly adorned with art and implements, including furniture. This is exactly what the Jewish historian Josephus tells us was inside David’s Tomb. 16 An analysis of Psalm 30 is my article “The House of David” at http://www.askelm.com/temple/t040801.htm. Some think that “house” in Psalm 30 refers to the Temple and that this Psalm is David’s posthumous dedication to it. This is not possible. The topics of Psalm 30 are death, burial, the pit, the grave, glory and implied resurrection, very unlikely topics for a joyous dedication of a Temple. However, those topics they fit perfectly if the “house” is a sepulcher. 17 Basically the Hebrew word “house” (bayeth or beyt) means one of two things. First, it can indicate a structure, a physical construction of some kind. A tomb or sepulcher would fit within this meaning of “house.” Second, it can mean descendants, such as the House of Jacob referring to Jacob’s descendants. “House of David” is used to convey both meanings in different contexts. 18 Shebna held a high position in the court of King Hezekiah of Judah. He was treasurer (or steward) in charge of the king’s household. He was to be punished for his pride and crimes (Isaiah 22:17–19, which likely caused the situation described earlier in Isaiah 22:1–14). Shebna was arrogantly constructing for himself a sepulcher worthy of a king. 19 Eliakim assumed all Shebna’s authority and accouterments that accompany that role, administering the government for Hezekiah, much like Joseph administered Egypt for Pharaoh. Eliakim was to be beneficent, like a father to those who live in Jerusalem and Judah. The name “Eliakim” means “God raises” or “God sets up.” This and other factors show that Isaiah 22:22 has a direct messianic reference as used in Revelation 3:7 where verse 22:22 is almost directly quoted, with an important modification, in the message to the ekklesia of Philadelphia where it refers specifically to Christ. 20 Why is the phrase “house of” missing? Perhaps because the “house of” portion may no longer be relevant when the prophecy of Revelation 3:7 is fulfilled. At that time the words, “the house of” David may already have been discovered. The “key of David” refers to the work of Christ to open and close a door for salvation (Revelation 3:7–8). 21 Here is a list of burials texts of David’s successors through Hezekiah: Solomon: 1 Kings 11:43; 2 Chronicles 9:31. Rehoboam: 1 Kings 14:31; 2 Chronicles 12:16 (buried in the “sepulchres of the kings,” Josephus, Antiquities of the Jews 8.264). Abijam (Abijah): 1 Kings 15:8; 2 Chronicles 14:1. Asa: 1 Kings 15:24; 2 Chronicles 16:13–14. Jehoshaphat: 1 Kings 22:50; 2 Chronicles 21:1. Jehoram (Joram): 2 Kings 8:24; 2 Chronicles 21:20. Ahaziah: 2 Kings 9:28; 2 Chronicles 22:9. Jehoash (Joash): 2 Kings 12:21; 2 Chronicles 24:25 (“buried in the king’s sepulchres at Jerusalem,” Josephus, Antiquities of the Jews 9.166);. Amaziah: 2 Kings 14:20; 2 Chronicles 25:28. Azariah (Uzziah): 2 Kings 15:7; 2 Chronicles 26:23. Jotham: 2 Kings 15:38; 2 Chronicles 27:9. Ahaz: 2 Kings 16:20; 2 Chronicles 28:27. Hezekiah: 2 Kings 20:21; 2 Chronicles 32:33. 22 In fact, the “chiefest” is rendered by several translations by “highest” or “in the ascent” of the sepulchers of the son of David. After Hezekiah none of the kings of Judah were buried in the City of David. See Yeivin, “Sepulchers of the Kings,” p. 33 and Na’aman, “Death Formulae,” p. 245: “The death formula changes in the histories of the kings from Hezekiah onward. The words ‘(was buried) with his ancestors in the City of David’ disappear.” The phrase “sons of David” may refer to Davidic kings, or it may mean that Hezekiah was buried near or inside the chambers containing literal sons borne to David’s wives and concubines, including those who rebelled against David. A complete list of the sons of David is in 1 Chronicles 3:1–9. 23 Here again we have reference to the place of the dead being in “high places” (Ezekiel 43:7) just like Shebna sought to construct for himself in Isaiah 22:16. Carcasses associated with high places are also referred to in Leviticus 26:30, indicating idolatry. 24 Some might wonder about the use of the phrases “children of Israel” and “house of Israel” in verse 7 regarding God’s throne and presence. The kingdom of Israel ceased to exist and was exiled from their land over 120+ years before Ezekiel had this vision. The reference is not to the northern Kingdom of Israel. God never placed His presence in the northern kingdom or with the kings of Israel, who were buried in Samaria. However, God is speaking in this vision as ruler of greater Israel, meaning all of the 12 tribes. Most of the vision of Ezekiel chapters 40–48 refers to a time future to Ezekiel; only this small portion of Ezekiel 43:1–12 looks to the past. The exiles in Babylon represented all Israel. 25 The Hebrew word in this verse is most often translated “door” rather than “threshold,” although the latter term is properly descriptive. “Posts” is always translated thus in the King James Version and most other translations. 26 Martin, Temples Jerusalem Forgot, pp. 348–355. 27 God’s punishments fit the crimes. Read Leviticus 26:29–29. See particularly verses 29-30. 28 Martin, Temples Jerusalem Forgot, pp. 402–405. 29 I presented this in my “House of David” article, see note 8 above. 30 Matthew 27:9 and see “The Land of Israel in Prophecy” at http://www.askelm.com/prophecy/p911201.htm. 31 Josephus further records that Herod’s family troubles were the result of his evil act of trying to enter David’s Tomb (Josephus, Antiquities of the Jews 16:188). In fact, after relating Herod’s family troubles the very next subject is Herod’s sudden desire to expand the Temple. One wonders if his night attempt to enter the sepulcher of David prompted guilt in Herod and in an attempt to do penance to God, he decided to glory God’s Temple. 32 Cited in “Water Management in Herod’s Temple” at http://www.askelm.com/temple/t011113.htm. 33 Gary Arvidson, In Search of King David’s Lost Tomb & Treasure, 2nd edition (Kings Mountain, NC: Gary Arvidson, 2001). 34 This should actually not be translated Edom, but it should be translated adam, or mankind. We know this not only because the Greek Old Testament, the LXX, translates it so, but because James translates it as adam in Acts 15:17. 35 Could the Ark of the Covenant be within the Tombs of David? It seems unlikely because Jeremiah states that the Ark shall not be spoken of, come to mind, remembered, visited, or done with anymore. The people shall appeal to the throne of God (Jeremiah 3:16–17). See also the generally reliable history of 2 Maccabees 2:1–19 which states that Jeremiah buried the Ark. 36 Solomon had the same documentation prepared by his court officials: “And the rest of the acts of Solomon, and all that he did, and his wisdom, are they not written in the book of the acts of Solomon?” (1 Kings 11:41). If Solomon is buried in the tombs of David, it is possible Solomon’s records would be available also. After Solomon most every king, whether of Judah or Israel, has a formulaic statement like this: “Now the rest of the acts of [X], and all that he did, are they not written in the book of the chronicles of the kings of [Judah or Israel]”? 38 During repairs made to the Temple during the reign of Josiah, King of Judah, a book of the law, a Torah, is discovered in the House of YHWH, the Temple, as told in 2 Kings 22:1–23:24. This discovery caused a repentance and a turn to righteousness in the kingdom of Judah by the people, the leaders, and the king. As a result God delayed His punishment upon Judah until the death of Josiah. By the nations and his repentance King Josiah did indeed “prolong his days in his kingdom.” They would have been prolonged even more if Josiah had obeyed God more carefully. 39 We know David wrote a very private letter himself in 2 Samuel 11:14. We also know that David instructed the priests to “minister before the Ark continually” (1 Chronicles 16:37) in accordance with “all that is written in the law of the Lord” (1 Chronicles 16:40) after the Ark of the Covenant was moved to Jerusalem. 40 Remember that the letters of the Hebrew alphabet were changed by Ezra the priest upon the return of the Jews from Babylon. The Hebrew letters today are different from the ancient Hebrew letters that David would have written.